This tree in Colorado Tolerant of poor alkaline soils and cold winters. 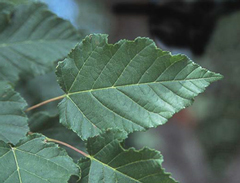 Less prone to develop iron chlorosis in alkaline soils than its close relative Amur Maple. 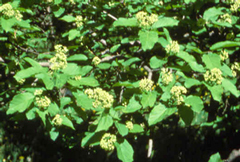 Some botanists consider Amur Maple to be a subspecies of Tatarian Maple. 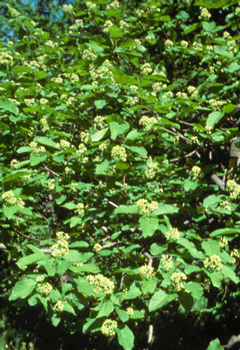 Hardiness Best in Zones 3-6, to 8000 ft. elevation; slightly less hardy than Amur Maple. Growth habit Large, multi-stemmed shrub or small rounded tree. Growth rate Slow to medium growth to 15 – 20 feet tall. Foliage Opposite, simple, medium to dark green, not as obviously lobed as other maples’ leaves. Fall color varies from yellow to reddish-orange to reddish-purple, often less vivid than Amur Maple fall color. Flowers Small, off-white, attractive, early May to June depending on elevation and exposure. 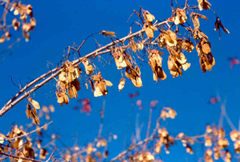 Fruit 1″ long twin samaras turn red in August, then brown in fall, often persisting through winter. Insects and diseases Few problems, possible leafspots. Landscape value Attractive small tree for limited spaces. Does well in alkaline soils; moderately drought tolerant. 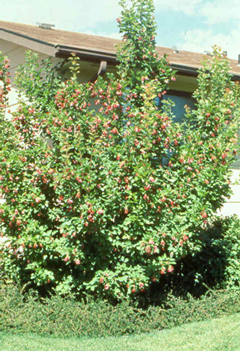 Flowers, red fruit/seeds and fall color are assets; popularity in Colorado should increase as cultivars with dependable red fall color are released. Small mature size makes it good for planting under power lines; tolerates partial shade.